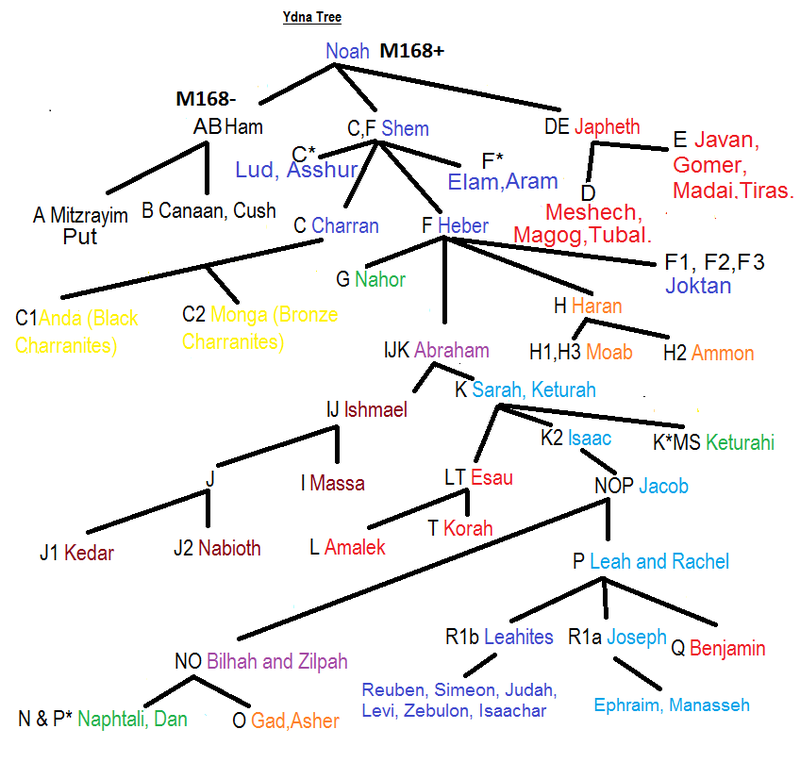 A blog for an alternative view of history, genealogy, origins, legends, and genetics based on a Biblical and Catholic perspective. 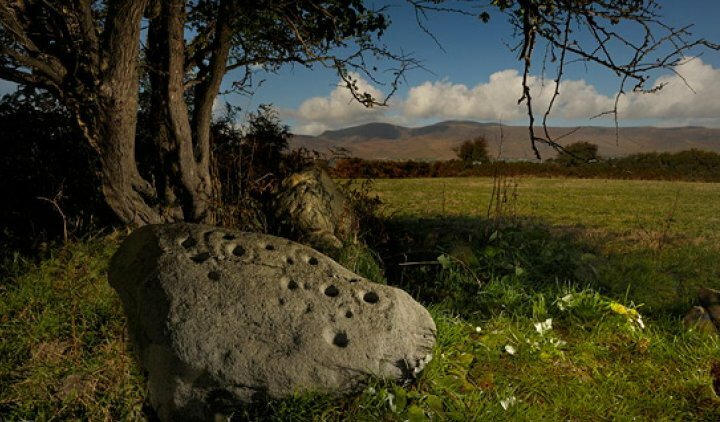 A stone near the Ballykissane Cillin with Jewish kabbalistic symbols. 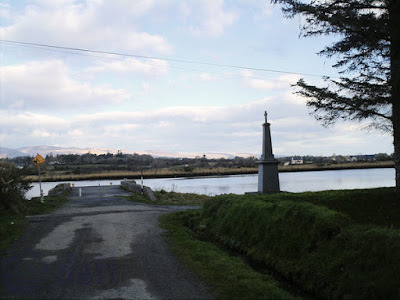 Recently I learnt of an Irish legend told about the Kissane and Cashman families. 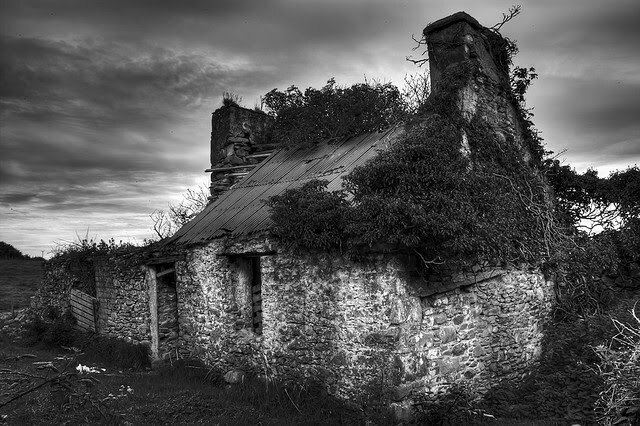 An Irish legend states that the family who originally were called Kassin (which became Ciosain in Gaelic)had a fight over "taking the soup" and the Cashman moved from Galway to Cork and the Kissane to Kerry to the village of Ballykissane. The term taking the soup referred to those who changed their religion during the potato famine in order not to starve. However the split with the Cashman and Kissane happened much earlier in the 16th or 17th century. The legend is thus a confused memory of one group who embraced Catholicism and the other remaining loyal to Judaism with a later story of those who changed from Catholic to Protestant in the 19th century. It would seem that the Kissane's who moved to Ballykissane remained loyal to the Jewish faith at least in the privacy of their homes and among their relatives. Many of these Kissane later after 1760 embraced the Frankist version of Catholicism and gradually assimilated into the Irish Catholic population. It would seem that the Cashman families of Cork descend from Shamus Ciosain (Yacov Kassin/Cassin) whose son was Joseph Cashman (c.1600). Ballykissane was the village that the TV show Ballykissangel was based on and is a village near Killorglin on the famous Ring of Kerry. Stephen Joseph Kissane writes on the Kissane facebook page: "Ballykissane has a burial ground that is called a disused Cillín and has a very sad history. It was used initially for non Christian Kissane Crypto Jews and for infants of Christian parents who died before baptism. The un-baptised infants and crypto Jews were buried away from the consecrated graveyard alongside murderers, lunatics and others deemed beyond salvation. Kissanes had ceased to live in the immediate area by 1911 but the infant burials continued until 1959.Only small broken stones now mark the graves and the graveyard very overgrown. A standing stone with a plaque of remembrance for the infant children buried here was erected recently. Kissane kabbalistic symbols exist on a stone. Along both sides of a fissure are five cup and rings and around 12 deep and rounded cup marks. Other rings may have weathered away." The number five and the symbol of the ring is a Kissane emblem as I explained in my earlier article on the Kissane/Kassin family. The cups represent their role as Swan Knights who protected the Grail which was associated with the "Cup of Blessing" mentioned in the opening of the Zohar. An Irish historian David Ring also writes about the Kissane origins: "The Irish name Kissane used in County Kerry is an Anglicization of O' Ciosain. Essentially now a Munster name, it was transformed to Cashman in County Cork and Kissane in County Kerry. Father Woulfe, and early expert on names, suggests that the O'Ciosain sept originated in Ui Maine in County Galway and moved South from there. In Dublin's Royal Irish Academy, there are accounts of O' Ciosains who were scribes and writers of Irish tales and tracts on Irish grammar. In the 1930s, John Kissane, writing as Sean O' Ciosain, translated the Vicar of Wakefield and other classics into Irish. Around this same period, the Reverend Edward Joseph Kissane was writing bible commentaries. (The Dictionary of Irish Surnames, Ida Grehan.) Other well known Kissane's include: Eamonn Kissane, a member of the Dail Eireann, first elected in 1932 as a Fianna Fail Representative, Erin Kissane, an internationally known business writer and editor, and Bill Kissane, a university professor and writer who has published many works on politics, civil wars, and particularly The Irish Civil War. Additionally, John Kissane owns a sheep farm on the Ring of Kerry that is dedicated to preserving the Irish heritage of mountain sheep. In the United States, the Kissane's have been successful in many areas, particularly business and higher education. The majority of the Kissane's that came to the United States settled in New York and Illinois. Civil War records show that five Kissane's served in that conflict, four on the Union side and one Confederate. The honor and great heritage of this family is proudly represented by our own Division 7 President Dan Kissane. Dan is truly the personification of the Kissane motto: "Nothing is difficult to the brave and the faithful."" Jim Cashman originally from Cork writes:"...Also when I worked with an American firm I found it beneficial as the Irish Americans seemed to know the name was Irish and my Jewish customers often thought I was Jewish, which suited me fine! All in all the name 'Cashman" is a good one! When I was a child in Ireland, the everyday language was English and indeed my parents spoke very little Gaelic. But when I went to boarding school around the age of twelve, Gaelic was more often spoken in class than was English. So it came as a surprise to me to find that there were two people with different names in English which became the same as mine when in Gaelic. The name was Ciosain or O'Ciosain. I always knew this was the Gaelic for my name but when a fellow called Kissane also called himself O'Ciosain I decided I had better take a deeper look into the origins of our name "Cios" I was told by our teacher means 'tax' in Gaelic so it was likely that originally, back in one of Britain's plantations the Ciosain Clan were tax-collectors brought in from Scotland, since the Scots and the Irish are the same Celtic race, it would be mutually acceptable. It was common for England when they conquered Irish land to 'plant' it with its own people. This was particularly prevalent around 1650 when Cromwell went to Ireland to conquer the country and to change it's religion. Up until then Ireland and England had the same religion. I was further told that during the Great Famine in 1845 some of the family of O Ciosain "took the soup" and the family split. One half changed their name to Cashman and the other half to Kissane which would have been a more natural derivation than Cashman. 'Drinking or taking the soup' referred to those starving people who went to soup-kitchens which made taking soup conditional on changing one's religion. Nobody seemed to know which side drank the soup...it depended on which side of the family one came from..."
It would seem that the Jewish Kissane/Kassin family of merchants were also to be found in Morocco where a mountain called Jebel Kissane was named after them by the Jewish inhabitants of the town of Agdz. 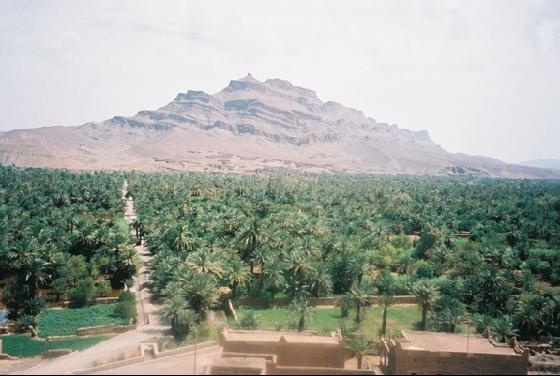 This area of Morocco was once a centre of Jewish civilisation for many centuries. This area today is very dry and arid but it is believed to have been wetter and more fertile in the past and the Draa river extended at that time to the Atlantic. Remains of ships have been found in this area of the desert. Many of the crypto-Jews of Claddagh and the Galway Bay area were fishermen and sailors and it would seem that a group of Jews led by a Kissane went to live in the Jewish settlements of the region that surrounded what was called Jebel Kissane (the mountain of Kissane) as part of the Sephardi community called the Megorashim. In the far north of Morocco is also found the settlement of Beni Kissane (sons of Kissane). 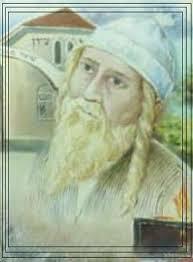 We also know that Rabbi Abraham Kassin (1810-1897 of Aleppo)[son of Rabbi Bekhor Kassin (1745-1877)]visited Morocco in the 19th century. Note: The Australian pronunciation of Kissane and Kassin sounds different but the Irish pronunciation of Kissane and Ciosain sound almost identical to Kassin. Also Kissane pronounced Kissani in Africa is the plural form. 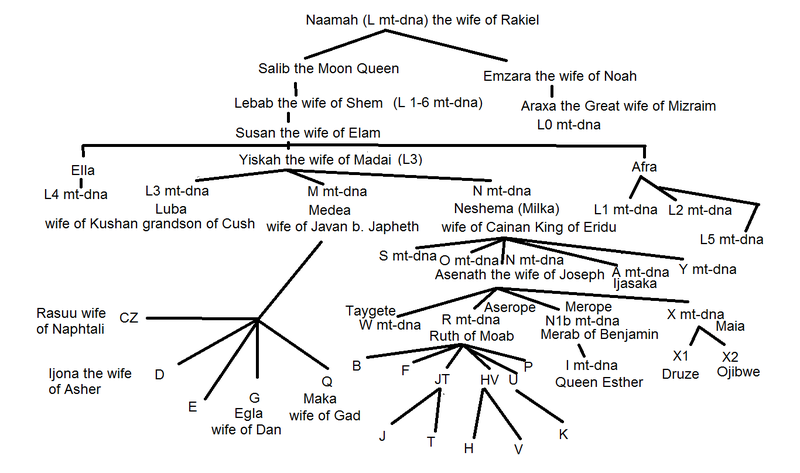 Thus Beni Kissani/Kissane means sons of the Kissan/Kassin. Interesting piece of writing. The bit about Cashman or Kissane taking the soup during famine times is however fiction. The separation of the name Cashman and Kissane goes back at least to 1690 and possibly earlier to the time of Cromwell. The years 1640 to 1690 were difficult. The names as Cashman, Kissane and Kissane-Rogers in an Irish context seem to have a common origin as Marrano immigrants from a single family. However once their Crypto Jewish veneer was lost, the once united family became, Irish Catholic or Irish Church - The Church of Ireland or Presbyterian. There was no taking of the soup. They did not need it as they were landed and even the poorest maintained herds of animals. Their reputation was as harsh rent collectors up to and including the time of the famine. Griffiths Valuation is useful in this regard. I do not think it is fiction merely a confusion as the term "taking the soup" meant changing religion for political or social reasons. Using the term for those who did so before the 19th century is anachronistic but still expresses the belief that the split between the Kissanes and Cashmans was due to one group embracing a different religion than the other. My aunt who visited Kerry in the 1970's and met some of the old Kissanes at that time spoke of the Kissanes coming from the North of Kerry to the Black Valley and that they were Jewish tax collectors and very big and strong. She mentioned some stories of two such Kissane brothers who still lived in the Black Valley (before the 1970's). I was also on the Ring of Kerry in 2008. While surfing the internet I found this account which confirms that of my aunt.this was posted by Allen Kissane. The English name "Kissane" is a phonetic anglicisation of the Gaelic name "Ã“ CÃ osÃ¡in", where the "O", the first "i" and the "a" all have acute accents to broaden the vowels. I know this to be true from when I learned Gaelic in school and from my Grandfather who spoke fluent Gaelic. Ã“ (or O accent) means "son of". CÃ os (or Cios - accent on i) means "rent". Ãin (or Ain - accent on A) means "the act of driving", e.g. driving cattle. Combined into Ã“ CÃ osÃ¡in, the name means "Son of the Rent Driver". In olden days, subjects of the local Chieftain were required to pay rent, normally in the form of livestock, to their Chieftain who leased them land to farm. The original Kissanes were employed by the Black Valley Chieftain at one time to collect this rent. Seemingly, the Kissanes at that time were taller and bigger than other families and therefore better suited to extracting the rent from the Chieftain's subjects. Rent was normally paid in sheep or cattle and the Kissanes had to collect the cattle and sheep and drive them back to the Chieftain - hence "driving the rent"!! Fr. Jimmy told me he remembers cycling in the Black Valley one Autumn in the early 1950s and coming across two old men with two sheepdogs driving a flock of 3 or 400 sheep along the road. When the flock passed he asked the two men where they were driving the sheep. They told him they were gathering the sheep from neighbouring hills and valleys where they were grazing for the Summer to bring them back to their farm to shelter for the Winter. When he asked them their names they told him they were Kissanes and when they heard he was a Kissane too, they told him some of the history of the Kissanes that they knew. from North Kerry. Fr. Jimmy told me that there is still one old woman living in the Black Valley who is a Kissane but there are no male Kissanes left. He also told me there is a small church in the Black Valley which he has seen which makes reference to the Kissanes in two of it's stained glass windows - I don't know when the church was built." Griffiths Valuation for Knochnane Kerry from where my Kissane ancestors came. Some one just sent me this site. I am the Allen Kissane that posted the article from Eamon Kissane about the Kissane name. I found a Patrick Kissane that came to the US then changed his name to Cashman. I am the granddaughter of a Cork Cashman. My grandmother used to say that they called her father the Jew. The family is still very much Roman Catholic but the Jewish reference came up when I told my grandmother I was converting to Judiasm. Everyone said she was making it up but when I came across this site I was amazed. I would love to know more about the history. Can anyone direct me? What Stephen Kissane says above is correct. The famine was not until 1845 and onwards. The Kissanes had settled in North Kerry in early 1700's and by all accounts they originally came up from the Black Valley as rent collectors and cattle/ herding experts.This continued in North Kerry. If there was a split in the name it was long before the Famine. The evidence from Fr. Jimmy Kissane also appears to be correct. Much of the other stuff is not evidence based. This blog is to share some of my insights drawn from over 30 or so years of research. Three major influences in the area of history on me have been the writings of Immanuel Velikovsky, Cecil Roth and Arthur Zuckerman. 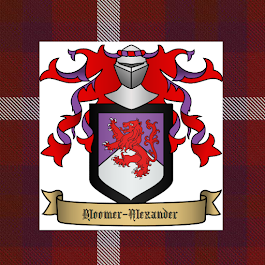 In my younger years, I was also inspired in the area of genealogy and heraldry by Leslie Gilbert Pine and Sir Iain Moncreiffe and did a course in Genealogy and Heraldry with Dr Douglas Sutherland-Bruce at UWA. In more recent years I have also been inspired by the writings of Christopher Dawson. I have a BA majoring in History and minoring in Ancient History, English Literature and Music. I have a Grad.Dip Ed in History, English and RE, a Master of Arts in Theological Studies and presently studying a Master of Theological Studies which includes units in Hebrew, Greek, Latin and Aramaic among other theological studies. I am also formed by the Bible and other religious writings within both the Jewish and Catholic traditions. In accord with Catholic teaching I believe that the Bible is inerrant and infallible as originally written in all its parts and it is the love of God and the Holy Scriptures that animates my research and writings. The ideas expressed here are my own and do not necessarily represent those of any organisation I belong to.